1. U.S. Geological Survey News Release on Tracked Loons - interesting information on the study and loons in general. 2. 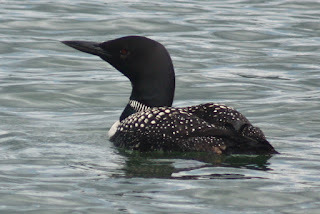 Common Loon Migration Study Home Page - if the first "box" of links doesn't work, scroll down to try the second "box" of links. 3. Loon Study - Frequently Asked Questions - in which you will find that Minnesota has the largest Common Loon population in the continental U.S.
4. More About the Current Loon Study - they use "Geolocator tags" attached by leg bands on the loons to record daily location, temperature, and water-pressure data. This information is both fascinating and amazing as I consider the distances and dangers to these magnificent birds.